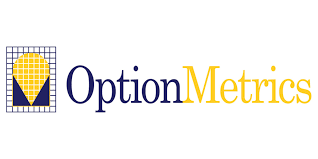 Founded in 1999, OptionMetrics distributes its IvyDB historical options databases for U.S., Canada, Europe, Asia, and global indices to corporate and institutional subscribers, as well as top business schools worldwide. It has covered every U.S. strike and expiration option on over 3,000 underlying stocks and indices since 1996. Leading portfolio managers, equity options traders, and quantitative researchers rely on OptionMetrics for extensive, high-quality data to construct and test options investment strategies, perform empirical research, and accurately assess risk.